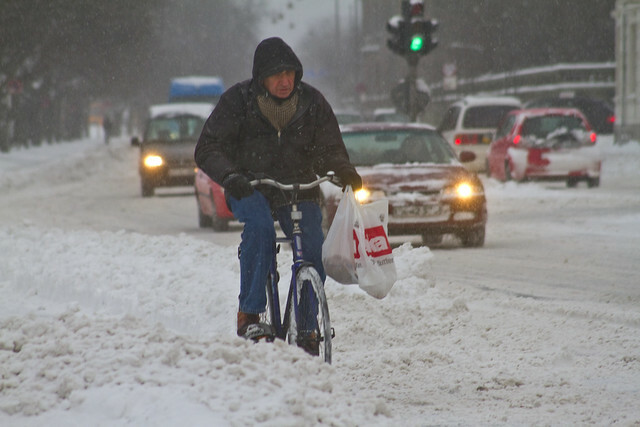 Right off the bat we're going to link to a recent post featuring photos of cyclists in Copenhagen in the winter. Thanks to Eleanor for the following link. "Cyclist hit by car. Transported to hospital". (We hope he is okay). Now the comments that often accompany bicycle-related stories in the Anglo-Saxon world are often entertaining and creative - as well as healthy, shocking reminders of the extent of our deeply-rooted car culture. The ones that follow this story are hilarious. With all the laws new and old to protect people from themselves,why have they not made it illegal to operate a bike in the winter? The roads and conditions are hard enough to navigate in the winter never mind having to keep an eye out for someone on an unstable bike. I disagree, about making it a law, honestly why do we need such a silly law when it's simple common sense!..ITS WINTER people...you can't afford a car or a bus or a cab, give yourself time to walk to your destination!...some people I swear! The driver of the vehicle better not be charged unless he did something very wrong...there is NO reason for people to be riding bicycles in this kind of weather/environment. As a matter of fact, it should be against the law to ride a bicycle on city streets during the winter time. If I knew how to push this forward and make a huge issue of it and try to get a bylaw passed I surely would. Pro environment people this time don't have a leg to stand on because insisting on riding your green bicycles is putting the riders at risk and increasing the chances of accidents where they otherwise would likely not happen. Is winter time people, PUT THE BICYCLES AWAY! As a matter of fact, for the first time I think I am going to inquire as to how to get the process started of getting this banned in Thunder Bay. I am sick and tired of having to dodge these people in the winter who still think its they're god given right to ride bicycles in the dead of winter! Yes, please do get started on your bylaw to ban winter cycling. Also, winter jogging. And winter walking. These people are hazards to themselves and to all those around them. Or.... people could just learn to drive. Swirly-Q, I can't help but assume you're being sarcastic. It's against the law to operate a motorcycle in the winter, it should be the same for bicycles. The cyclists can opt to ride the bus, walk, jog, and if we have a huge snow storm, snowmobile in the winter time. (...) it's absolutely stupid to be riding your bike in the winter. It's tough to see bikes sometimes. And when it's winter, you can't stop quite as easily as in summer. Nor can a bike. And when your 40 lbs of Zellers collides with a huge SUV, guess who is going to come out looking prettier? Either make it legal and mandatory for bikes to operate on the sidewalk in the winter and take their right of way away or ban cycling in the winter altogether. There is a MASSIVE difference between cycling in the winter and walking. Bicycles do not have the proper traction for winter weather. They are going to skid and swerve, and often in front of a car. An accident like this was only a matter of time, and more will happen, because people expect everyone else to move around them. And it goes on and on. This is definately one of the more entertaining comment list. Note: Spelling mistakes are courtesy of the commenters.